Dr. Kriva is pleased to announce the release of his new book Life Pearls. This book was written with Pastor Marty Hanson and provides a collection of 21 stories from everyday life that contain hope and inspiration for all of us. Each story has a “pearl” providing an insight into the deeper meaning of the story. The book includes room for you to add your own reflections as you contemplate the meanings for your own life. If you are looking for inspiration, copies can be purchased at Amazon.com and other on line book stores. Dr. Kriva will be happy to sign your copy for you if you bring it into the office. 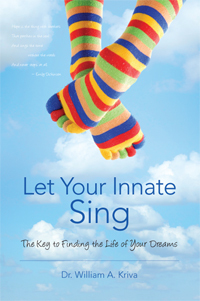 LET YOUR INNATE SING is an inspirational book written for any person who is contemplating a major life change, but iseither trapped by fear or unclear on how to proceed. Dr. Kriva expands on these principles and provides the reader with a step by step system to find their own unique path to the life of their dreams. This book is appropriate for any person, young or old, who is not happy with their current life circumstances and who needs help discerning the next step on their journey. For more information on finding the life of your dreams or to order please visit www.outskirtspress.com/letyourinnatesing.